BOSHAM and Sidlesham have had some close battles in recent league encounters - but come cup-final night, there was a clear winner. From the eighth minute, when Dave Storey outmuscled his marker to volley the Robins ahead, the trophy always looked likely to be on its way to Walton Lane. Nick Edgington added a superbly-finished second and Matt Docherty made sure there was to be no late comeback when he drove home the third. It sparked contrasting scenes at the final whistle as the red shirts of Bosham danced with delight and the greens of Sidlesham stood disconsolate, wondering where it had gone wrong. In the final league table, it was Sidlesham who came out on top in the sides’ local rivalry. 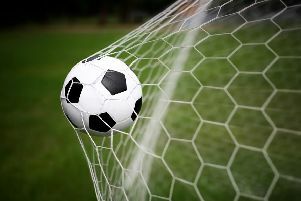 They finished second - denied the title only by Ferring’s last-day no-show against eventual champions Southwick - and look as though they will be playing in division two next season. Bosham had led the table going into the second half of the season but as their title hopes faded, their cup dream grew, and few would deny player-boss Andy Probee and his players this triumph. A crowd of 349 - as Bosham said themselves, not bad for a step-seven game - flocked to Nyetimber Lane, where Pagham proved fine hosts for an occasion that began in lovely evening sunlight and ended in temperatures more befitting of winter than spring. It was Sidlesham who had the best of the opening few minutes, spending most of the opening exchanges on the attack but tellingly unable to find room for a serious early attempt on goal. The best they could muster was Tom Bayley’s low shot, but it was straightforward for Robins keeper Kieran Magee. At the other end Marco Giambelardini - who was to prove a thorn in the Sids’ side all night - saw a shot blocked after a free-kick was taken quickly and was played into the box. The deadlock was broken on eight minutes when the ball was played through the centre to Storey, whose tussle with a defender ended with him having the space to volley high past the advancing John Pope and into the net. Sids’ appeals for a foul fell on deaf ears. Gary Jefkins’ team were knocked out of their early stride by the goal and a minute later, Giambelardini hurried a shot and saw it go wide of Pope’s near post. The same player - later named man of the match - struck one into the side netting before the quarter-hour was up. For Sids, Bayley twisted and turned in the area but couldn’t get a shot in, then as Bosham broke Tom Jefkins was booked for bringing down Adam Brett. It felt like Sidlesham were gradually settling into the game but when they almost gifted Giambelardini a goal on 26 minutes - Pope alert enough to block him - it was a sign of more trouble to come for them. Within the space of a minute they saw a chance tomake it 1-1 turn into a 2-0 deficit. Bayley was unmarked for a header that lacked power and when Magee gathered it, his clearance ran through to Edgington down the Bosham right, who beat a defender and keeper Pope in a race to the angle of the penalty area and volleyed the bouncing ball accurately and with just enough power to beat a retreating defender and go in. Bosham were jubilant and headed into the break knowing they had one hand on the cup. And despite Sids enjoying more of the possession in the second half and creating more dangerous moments, the outcome rarely looked in doubt. In fact the Reds were first to threaten after the break. James Wilson skied one from 25 yards while Giambelardini got behind the green defence once more but shot a couple of feet wide. Midway through the half Sids enojyed a spell of pressure in the Bosham that finally ended with John Phillips’ hanging cross to the far post being plucked from the night air by Magee. A minute later Dan Bassil headed over, and it was a sign of how well Bosham had defended that this was the first time the Sids pair - who have both had excellent seasons - had had a decent sight of goal. Magee was doing everything right and his best save came on 75 minutes when Joe Leggatt’s shot on the turn was parried away by the keeper from close range. There was nearly another goal on the break for Bosham as Edgington got on the end of their quick move forward to test Pope with a low left-footed effort. Five minutes from time Bosham played the ball in from the left and to Docherty, whose sweetly-hit drive was just beyond Pope to send the Walton Lane players and fans into full celebration mode. The final whistle saw those scenes step up a notch or two as they toasted a trophy-winning end to a long, hard season. There were medals for both teams before skipper Wilson lifted the cup and was mobbed by his team-mates. Many in the Bosham camp will have spared a moment’s thought for Dennis Probee, grandfather of manager and right-back Andy, father of Reds stalwart Bob and a former club president, who died just over a year ago but was probably watching from above. He’d certainly have approved of the professional way Bosham went about making sure they won the day. Sidlesham will wonder why they couldn’t reproduce their best league form on the big occasion but at least - as far as we know - can look forward to playing at the higher level next season. Bosham: Magee, Probee, Carter, Bryant, Edgington, Blanshard, Docherty, Wilson, Storey, Giambelardini, Brett. Subs: Barnes, Redman, Lafferty, Bell, Hasted. Sids: Pope, Grantham, Carrigher, Leggatt, Millins, T Jefkins, Bayley, McCoy, Bassil, Phillips, Bennett. Subs: Williams, Pearce, Reed, Pointing, J Jefkins. See reaction and pictures from the game in next week’s (April 30) Chichester Observer.